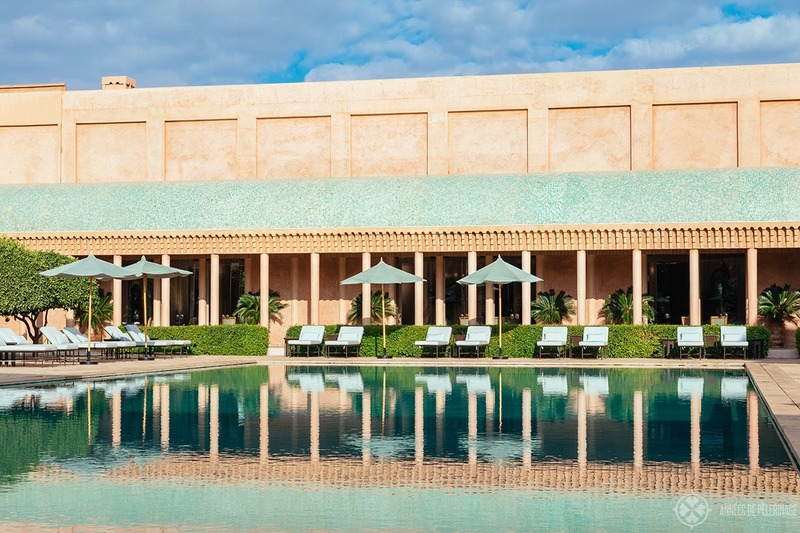 An unsponsored review of the Amanjena luxury resort in Marrakech. Are you looking for a luxury hotel you don’t ever want to leave? 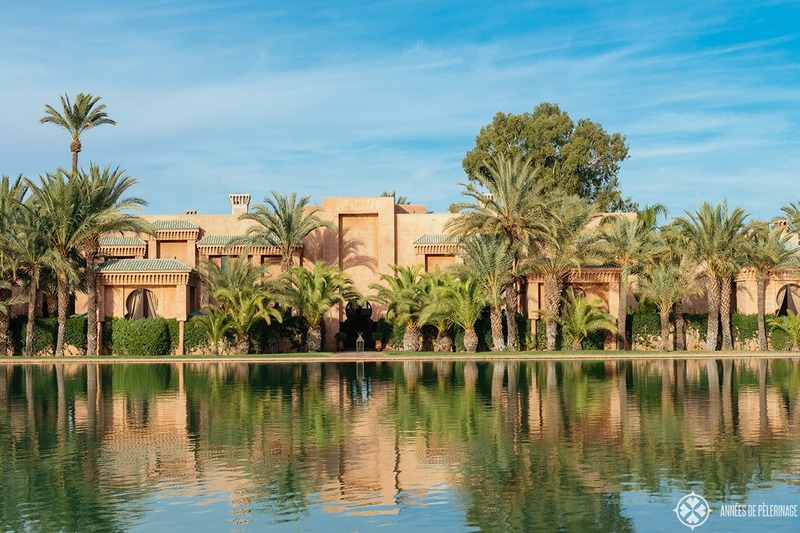 Right on the outskirts of Marrakech – far enough to be quiet & relaxing, yet close enough to the imperial city to not waste half of your holidays on transfers? Then this Amanjena review was written for you. 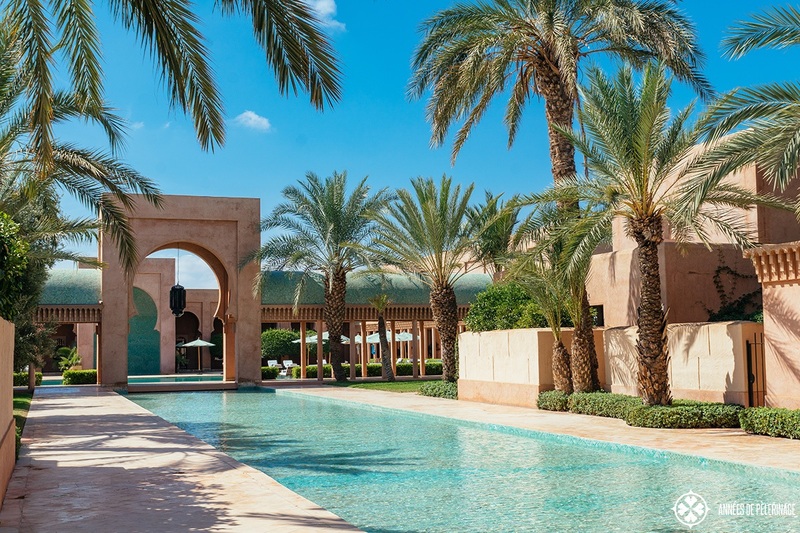 Aman is one of the most exclusive hotel chains in the world (if not the most exclusive) and Amanjena is no exception to their extremely high standard of luxury. 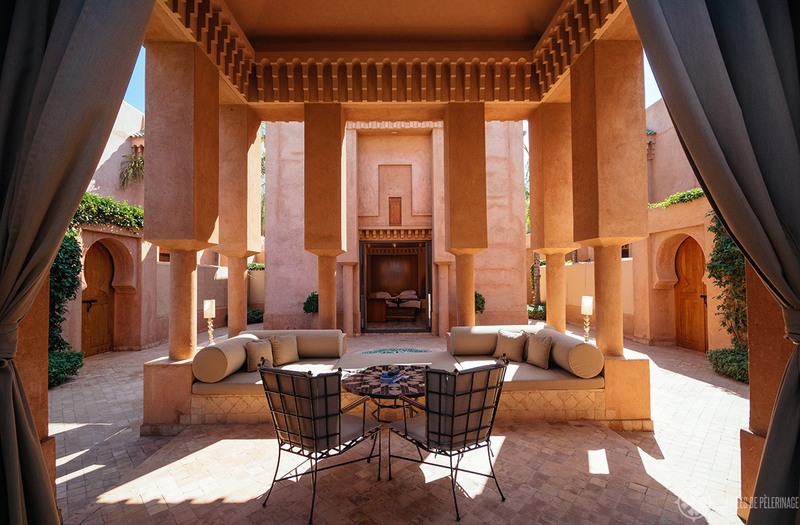 In fact, I’d go as far as saying it is the best hotel in Marrakech (Click here for the official website). I loved the property from day one on (stayed 5 nights altogether), but as this is an unsponsored & honest review, I won’t conceal the one or the other flaw either. Why? 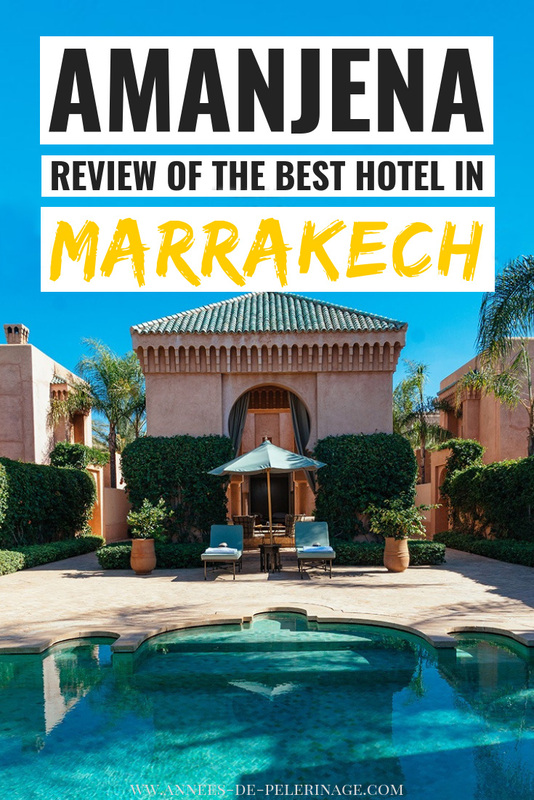 Well, I want you to be in the position to judge for yourself if it’s worth to stay at this outstanding five-star hotel in Marrakech or not. So, are you ready for my Amanjena review? Let’s start, shall we? Amanjena means “Peaceful paradise“, and I’d like to think that probably no better name could have been found for this tranquil haven. Like many other Aman resorts, Amanjena was designed by star architect Ed Tuttle, though it might just be his most beautiful project (for comparison, check out Amankila in Bali). 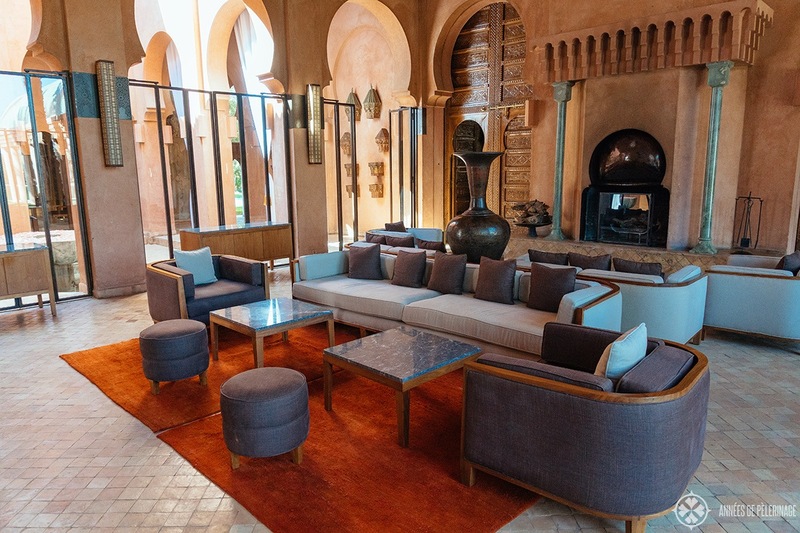 The hotel was inspired by traditional Moroccan architecture, and it truly feels like a modern interpretation of the El Badi Palace in downtown Marrakech. A gigantic central pond nourishes a tranquil oasis of villas and waterways. True to his word, Ed Tuttle only used traditional materials as well – no concrete but an ancient wash of clay and hay to give the walls the most authentic look and quite a pleasant patina. The whole property spans some 13 acres (feels more like 30, but that’s the number I found online) and has its own olive grove and an adjacent golf course. 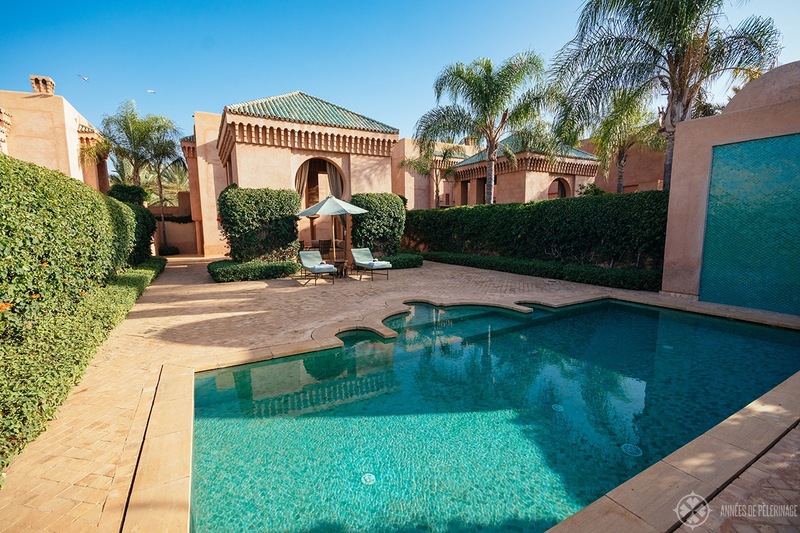 There are 39 extremely spacious villas altogether, most of them with their own private pool. 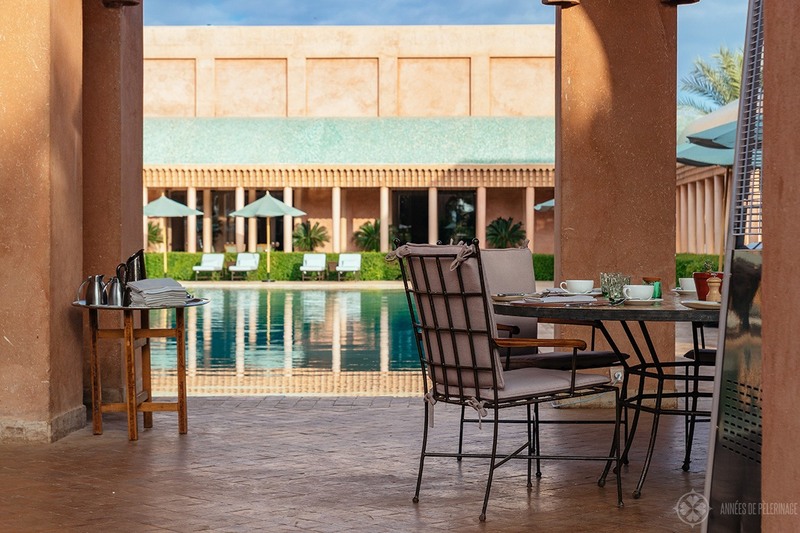 Unlike many other Aman resorts, Amanjena is quite condensed. Only walls separate your villa from the next, though there is quite a lot of open space. 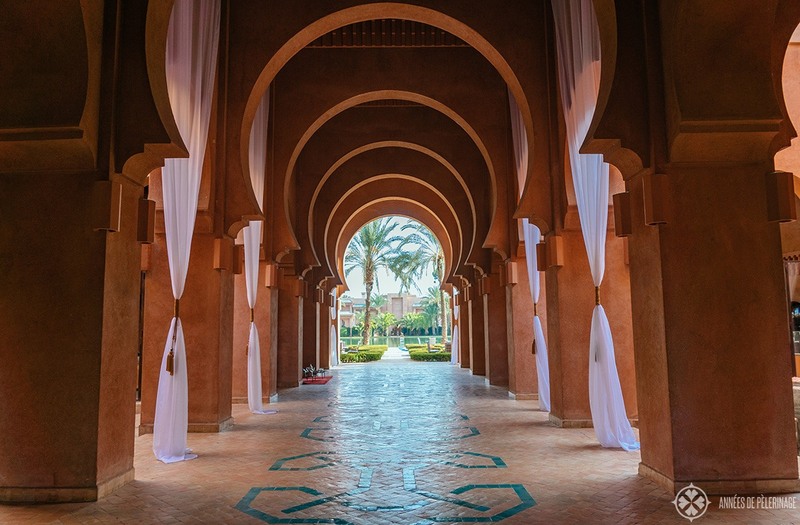 The central lobby is wide open on all sides, with a courtyard here and there, much like a palace from the Arabian nights. 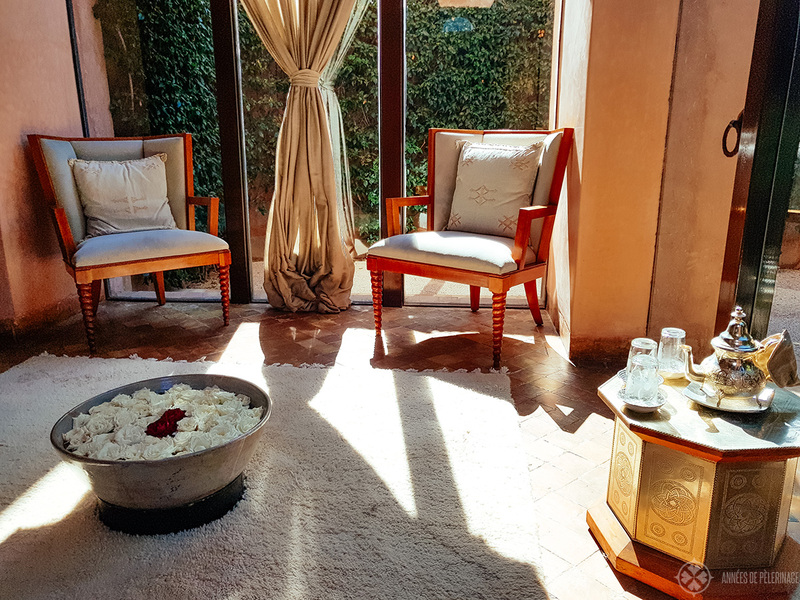 Imagine giant curtains wafting through the air, and a gargling fountain carrying the scent of the rose pedals within its wet expanse straight into your nose. I believe there are two invaluable assets in your life: Time and relaxing silence – and Amanjena seems to offer you both in copious amounts. 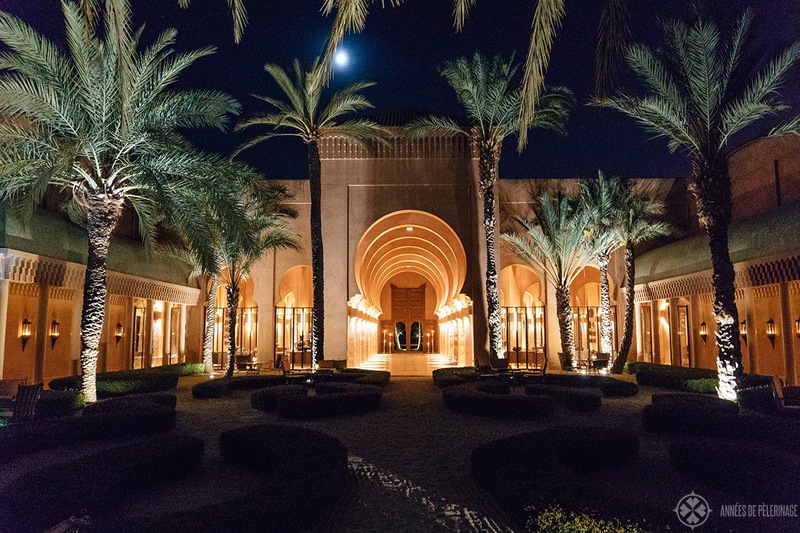 The moment you enter the huge portal into the resort, you are transported into another world. Note: I had no association whatsoever with Aman when writing this review. I stayed 5 nights in one of their Pavilion Piscine in October 2018, though I would like to mention I got an upgrade upon arrival. I’ll begin this Amanjena review with talking about the rooms. 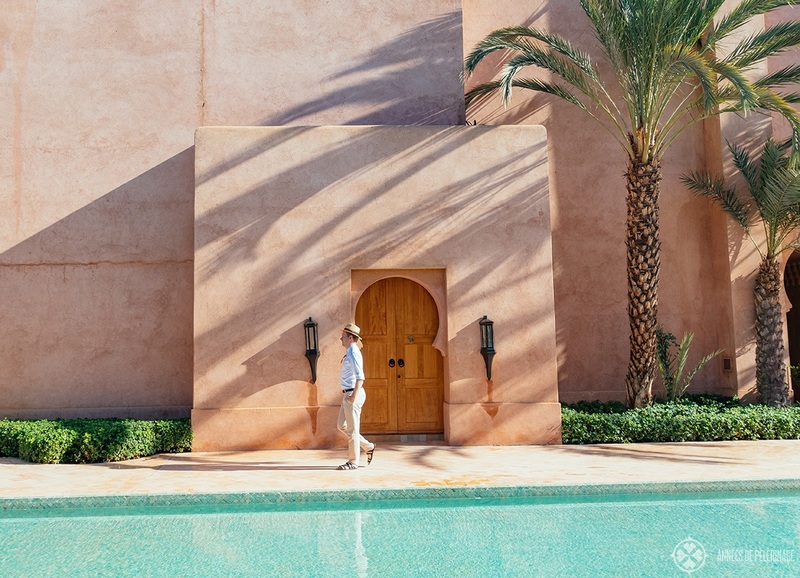 You see, everybody is raving about staying in Riad, but at Amanjena you are staying in a true palace – decide for yourself what’s better! 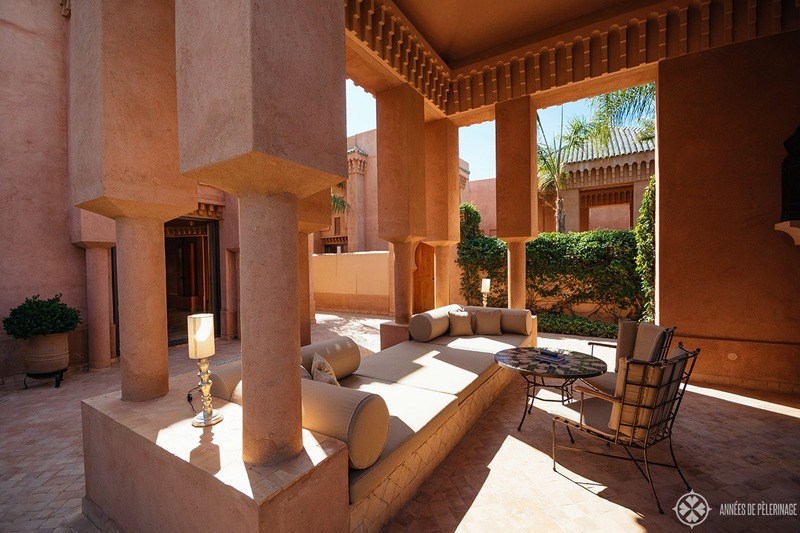 The pavilions, or let’s call them villas, at Amanjena, are not only truly stunning but also extremely spacious. The bathroom alone is probably twice as big as the first apartment I ever rented. My Pavilion Piscine had three distinct areas. A central pavilion, a garden gazebo, and the pool area – all surrounded by a verdant wall on all sides. From what I gathered, the normal garden villas share the exact same layout, except for the pool. 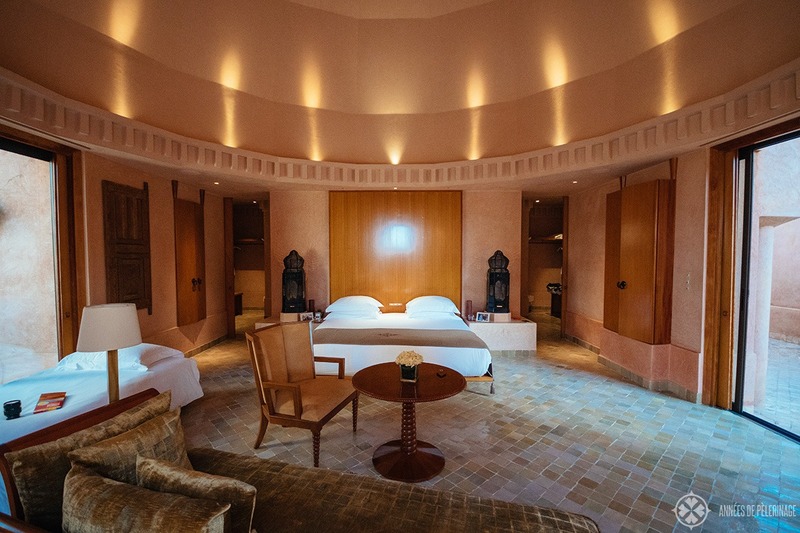 The wide-open bedroom has a huge cupola but totally lacks the ostentatious decoration so prevalent in other Moroccan hotels. Clean lines, subtle details, a flower bouquet here & there, and an open fireplace create the perfect mixture between coziness and luxury. The his and her bathroom is separated by sliding doors on each side of the huge king size bed. Ed Tuttle seems to hate doors, as they close up a living space, but given the fantastic layout of the central pavilion, who could fault him? The bathroom is, like I already mentioned, gigantic. I’d guess 50 square meters all in all. I’m sure you will love the two separate dressing areas as much as I did (I want this at home!). 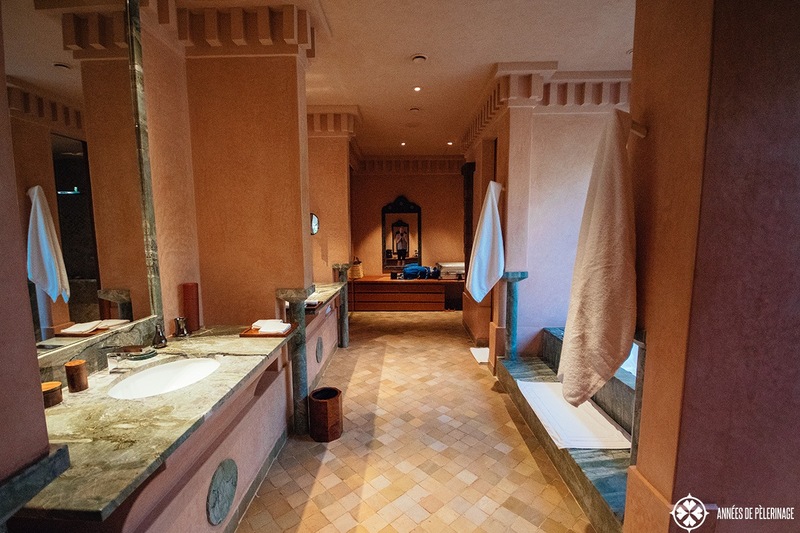 Shower and toilet are separated as well, while the central bathtub offers a view of a small courtyard garden, beautifully illuminated at night. Through a huge sliding door, you can enter the terrace beyond the bedroom, where a gazebo of epic proportion invites you to read a book or take an afternoon nap (or two). It’s big enough to have a party, though I happily enjoyed all that extra space all by myself. Last, but certainly not least, there is the private pool. It’s actually quite deep, though sadly does not allow a view of the surroundings. Two sun loungers face the pool on each side and you got two little in-water seats (would have been great if they had a jacuzzi function!). 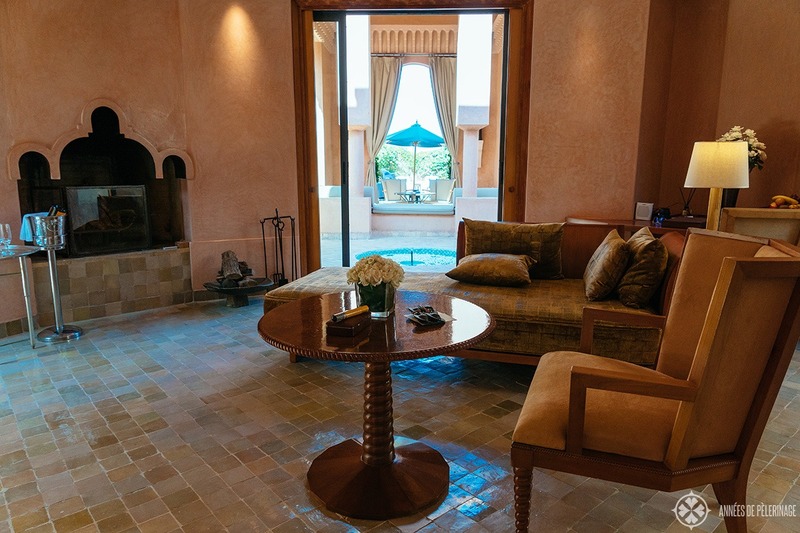 I read a couple of other reviews saying the close proximity of the other pool villas (just separated by a wall) means you are bound to hear the other guests as well. While I’m aware that small kids could certainly spoil the overall tranquility, I had no such problems during my stay, even though the hotel was fully booked at that time. Amanjena has a gorgeous pool right in the middle of the property. 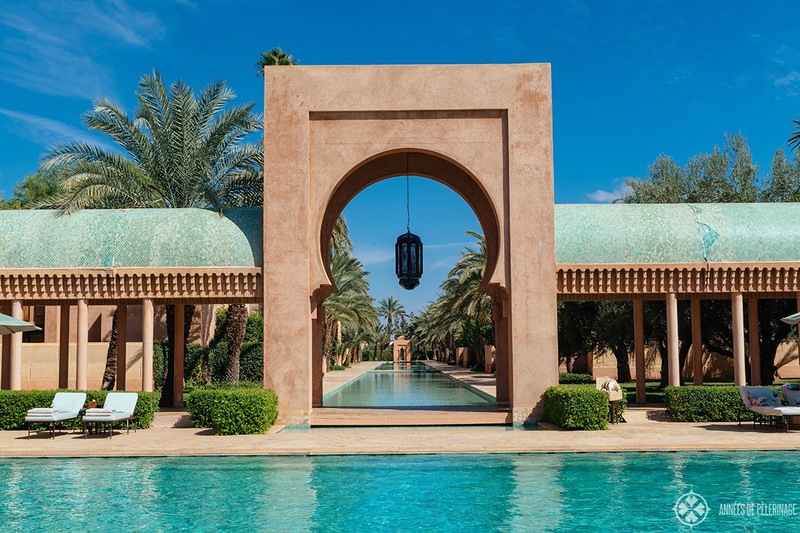 Giant arches and roofed hallways surround it on all side, creating the perfect sanctuary to enjoy the dazzling Moroccan sun in the shade of teal parasols. Pretty, as the pool is, I really have to admit I didn’t swim in it once. Ah, the perks of having your own private swimming pool, I guess. Funnily enough, the pool was relatively crowded in the afternoon (though as far as Aman resorts are concerned, crowded means you are not the only guest). As both the breakfast restaurant and the Japanese restaurant have a terrace facing the pool, I did enjoy the views a lot, though. 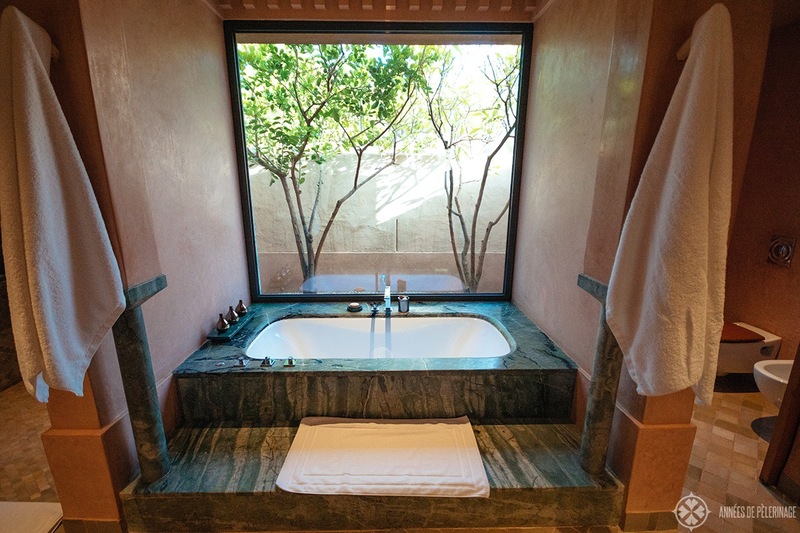 Amanjena is one of the older Aman properties, so it doesn’t have a 10,000 square meter spa (like Aman at Summer Palace or Aman Tokyo have). But the small facilities they got are nevertheless quite enchanting. And I have it from a trusted source (i.e. the assistant manager) that they are about to expand the spa soon. Of course, this Amanjena review wouldn’t be complete without testing the spa myself. I did book one traditional Hamam treatment and a massage. 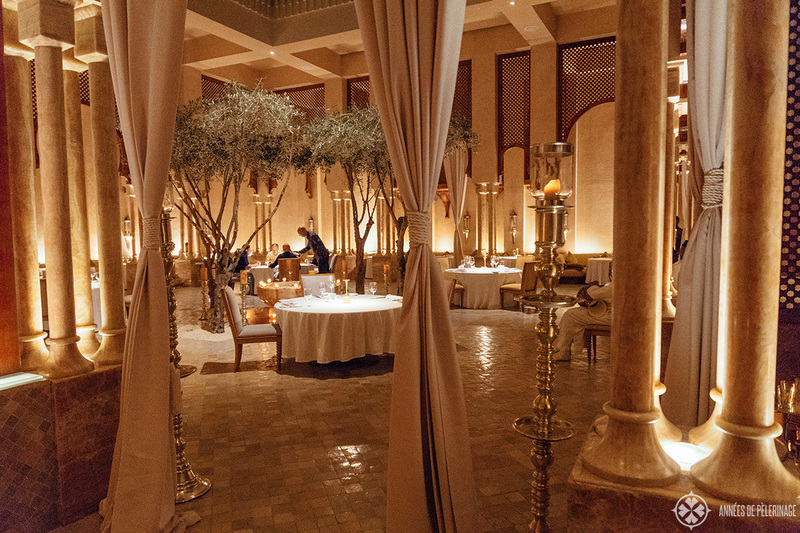 What can I say: I simply loved the little Aman hamam. It was just perfect. 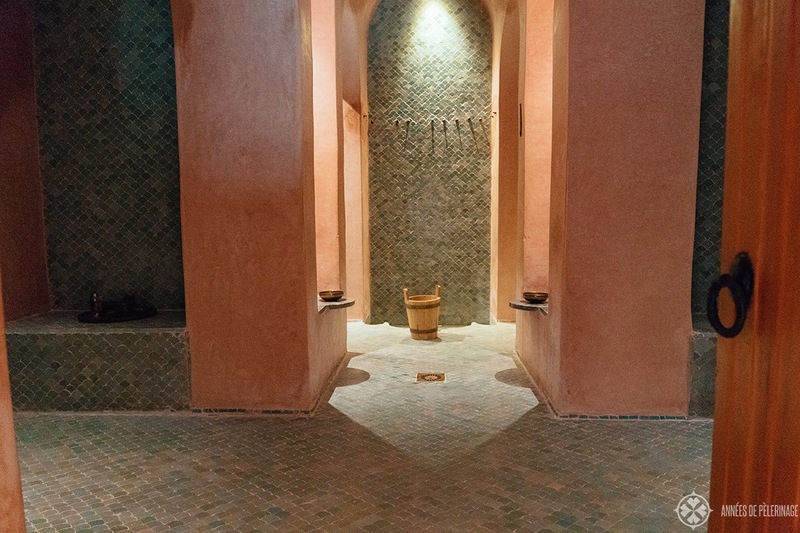 Naturally, having the hamam all to yourself is kind of an extra treat to a shy guy like me. The treatment was top-notch and try as I might, I couldn’t find a single fault. I sort of felt like being transported into another age. The following massage was rather lackluster. It was supposed to be a relaxing massage, but I’m not sure I felt any different than before. The individual cabins were rather noisy and the lady left the cabin twice without even saying a word. The whole massage was not really integrated beyond the mere job. While I was offered a tea before, I was sort of just ushered out afterward. Note: Spa treatment prices were, in terms of value, okay. I paid roughly 200 USD for the above-mentioned 2 hours treatment. Breakfast at Amanjena is truly unique. 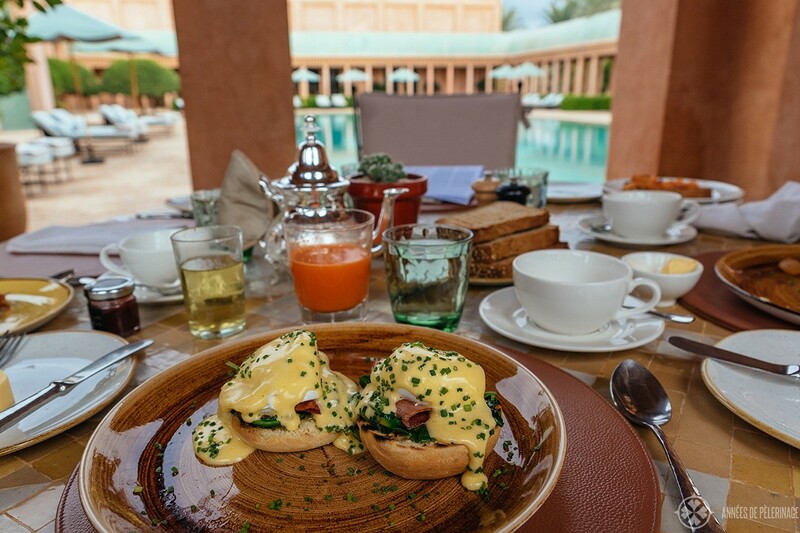 The breakfast restaurant is nestled under the arches at the far end of the pool, with stunning views of the latter. You can also opt to sit on the lawn, with views of the adjacent golf course. 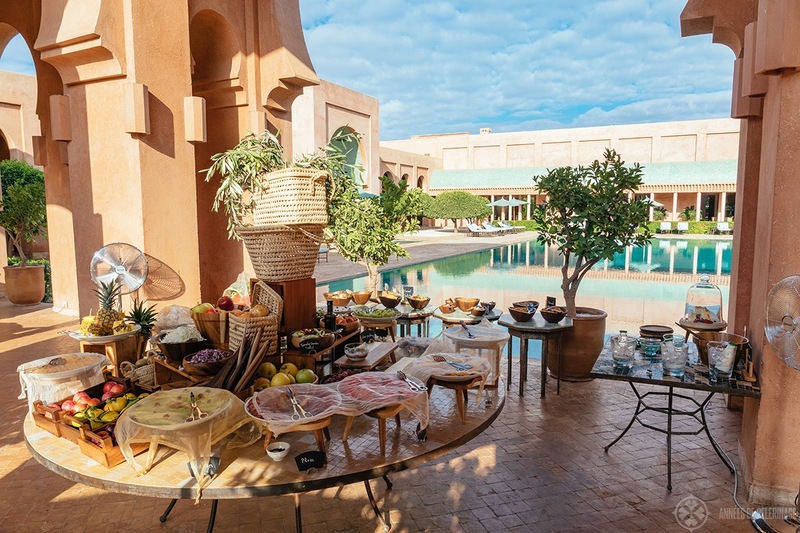 Amanjena is, I believe, the only Aman property that offers a buffet, though you may order à la carte whatever you wish. I am not entirely sure how I feel about the buffet. All things considered, I believe they should have just focused on the quality of the menu and find a different solution for the buffet. Open foodstuff just does not go well together with Morocco. There were birds picking on the bread whenever one of the waiters wasn’t watching and all fruits had to be secured by nets, which were clinging to the wetness below quite unpleasantly. That being said, whatever I ordered was fine. Not mind-blowing, but good in the way you’d expect it at a good luxury property. The scrambled eggs with oven roasted tomatoes were extraordinary, while I really didn’t agree with the Moroccan version of the eggs benedict (like they used vinegar instead of lemon juice for the sauce hollandaise). They didn’t mind my special orders and generally did everything to make my breakfast experience perfect. There is, however, no indoor breakfast room. While they offered blankets and placed heating devices next to the table (on one rather cold & rainy morning), I’m not entirely convinced this will be a pleasant affair in winter (I visited in October, where it was perfect!) for some of the more sensitive ladies. 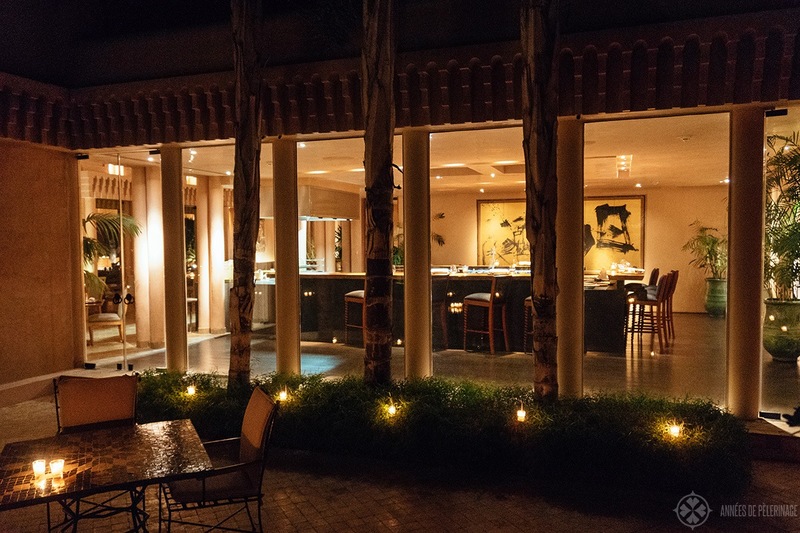 The first restaurant I tried at Amanjena was the Nama, a sushi bar and robata grill. All things considered, I am hesitant to recommend this restaurant. While there could be worse things than sitting on the terrace overlooking the nightly pool, the quality of the food was rather mixed. The Nasu Nibitashi (braised eggplant) I had was as excellent as the truffled sashimi with an egg yolk and miso marinade from the daily menu – both well worth their money and something I would happily eat again. 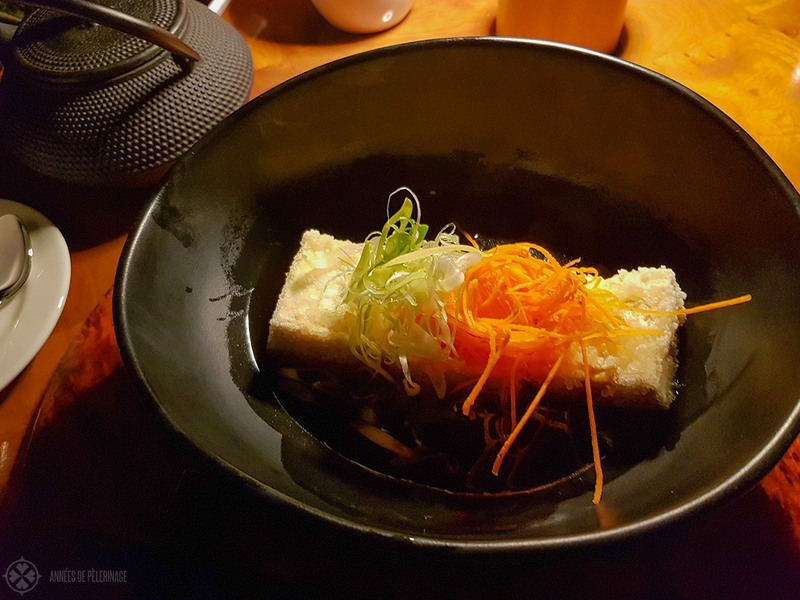 On my second night, I tried some Agedashi toufu (fried tofu) which sat in a tasteless broth, was all too crispy and substituted the balancing freshness of the daikon with bland carrots. The explanation of the chef that they couldn’t source potato starch in Morocco was not all that helpful. 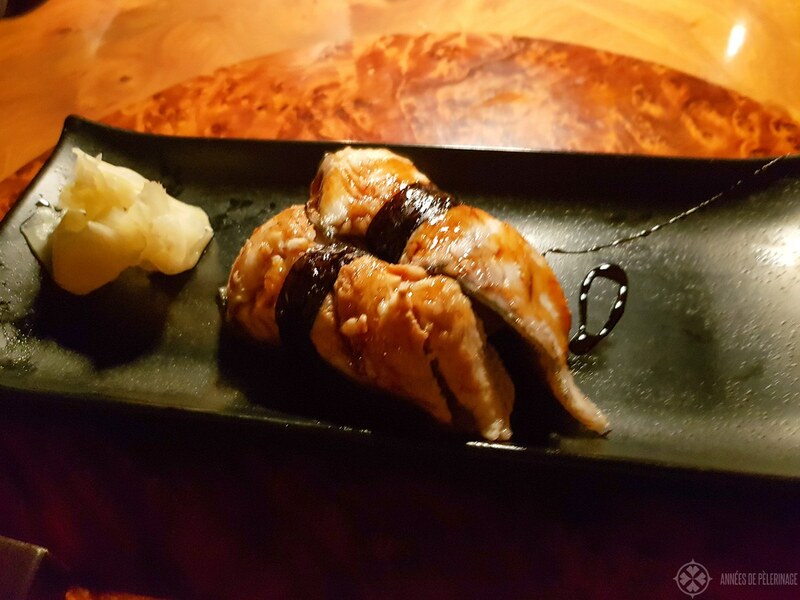 The unagi nigiri I had was okay, though the rice way too soft and squishy for my taste. So, all in all. If you expect authentic Japanese food, you will probably be disappointed (even though they got a Japanese chef from Osaka). But if you just want to eat a casual California roll and enjoy a lush evening on the terrace, you may find yourself in good company. 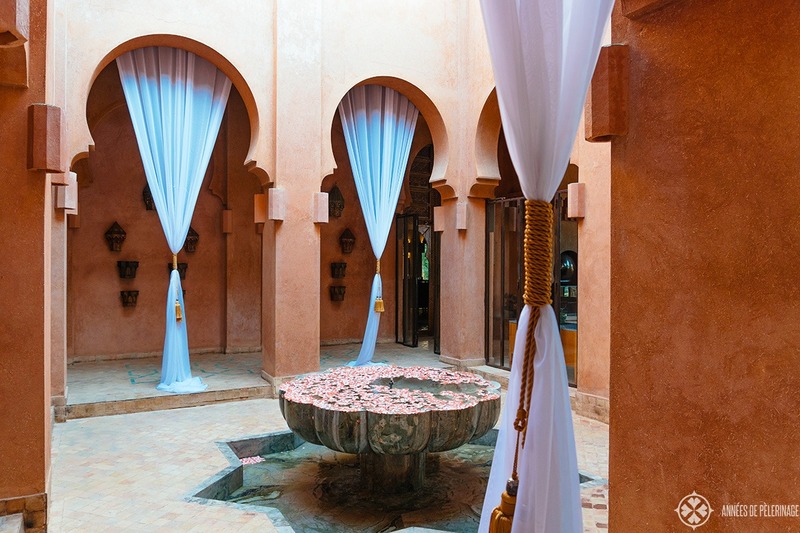 What can I say: The Moroccan restaurant is simply stunning. 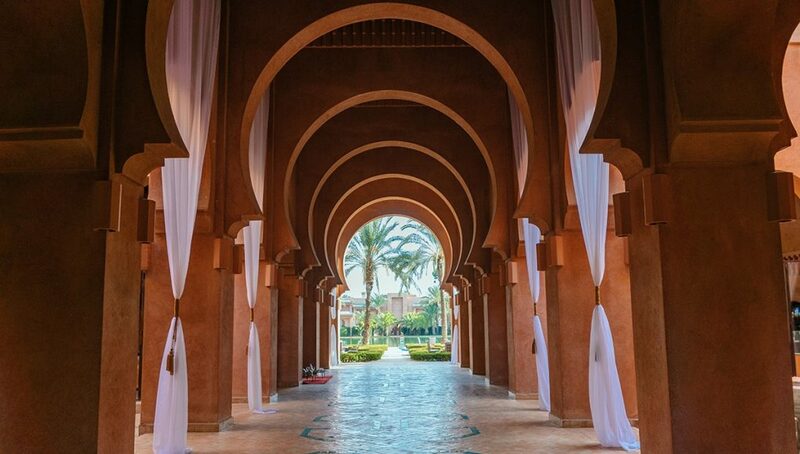 White alabaster columns, white cushions, white curtains, the flickering of candlelight in between, and a band playing Moroccan tunes – it feels truly palatial! 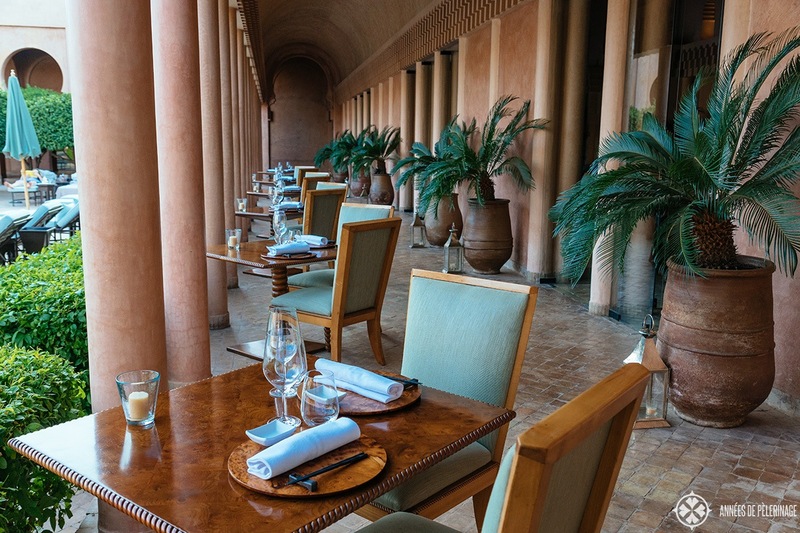 Of all the restaurants in Morocco I visited, this was by far the most beautiful one. The atmosphere is hard to describe, yet eerily perfect, though the restaurant could need a bit more guests to make it a tiny tack less deserted. But what kind of Amanjena review would this be, if I only mentioned the highlights? The food was, to be quite honest with you, more or less a disaster. I only had overpriced cafeteria-style dishes I am quite ashamed to share with you. 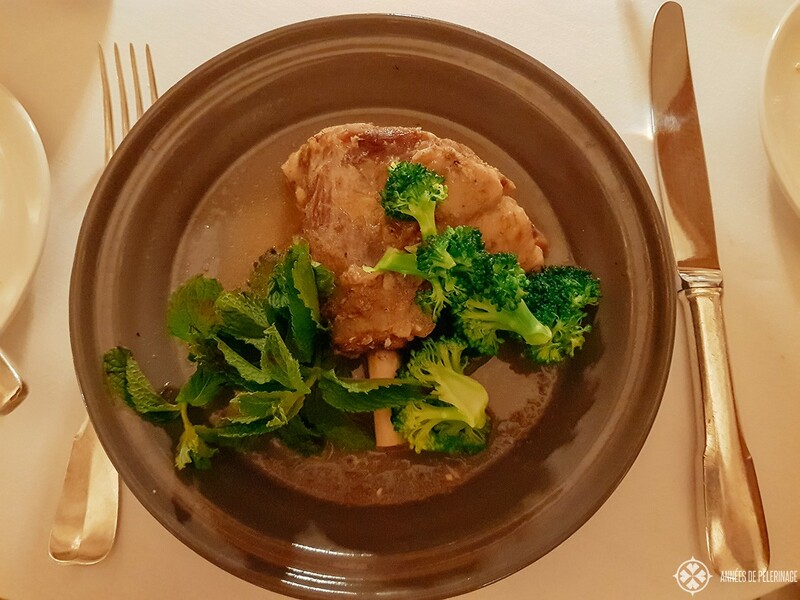 There was just about everything wrong with the lamb shank I had for the equivalent of 29 USD. I’m really sorry for choosing these harsh words, but I was literally speechless when it arrived at my table. The entré I had, traditional Briouats, was probably even worse. Oily bundles of fried tastelessness garnished with three salad leaves straight from a highway-rest-stop-hell. I am not sure who thought 18 USD for that dish was appropriate, but maybe things are a bit different in Morocco, who knows. As far as I know, you can order international food at this restaurant as well – just in case you want to enjoy the near-perfect atmosphere. Otherwise, I advise against eating here. 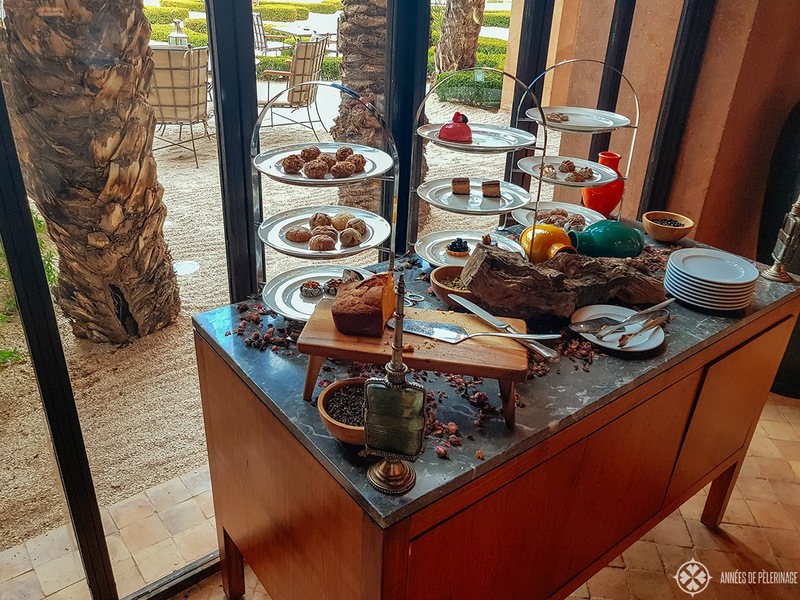 Like in many other Aman resorts throughout East Asia, there is a complimentary afternoon tea. 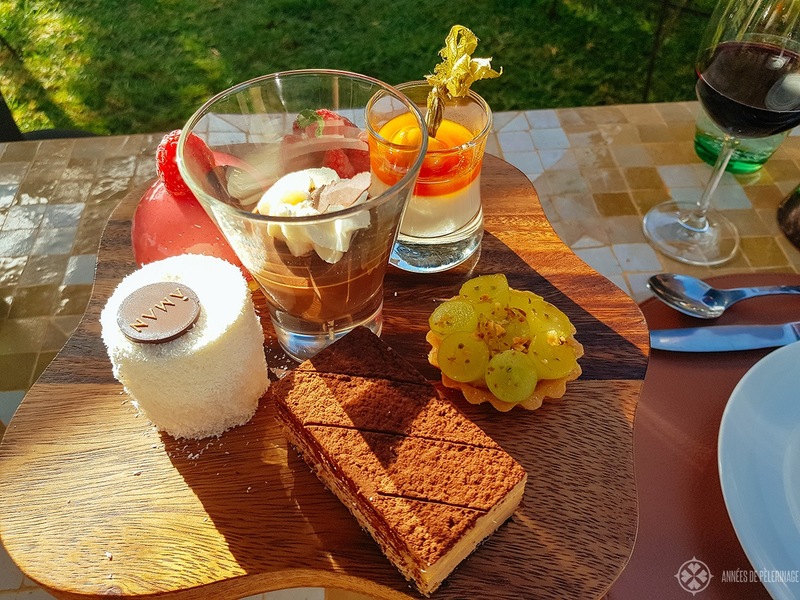 The quality of the buffet was excellent as was the range of pastries, cakes, and drinks. Quite the surprise, in fact. I was basically expecting some tea and maybe a cake or two, but not fresh juices, cocktails, some bubble, and so many delicious little nibbles! Sadly, I was only able to enjoy it on three days, and never saw a lot of other guests. No idea why it’s not more popular, but it would deserve to be! So, all things considered, I’d recommend you to book the breakfast, enjoy the amazing afternoon tea, but eat out for dinner. I am quite ambivalent about the service at Amanjena. Let’s start with the good part, eh? Upon arrival, we were greeted by the assistant general manager, who showed us around the whole property himself (and invited us the complimentary barbeque, as our rooms were not ready yet). This was not just a one-off thing. 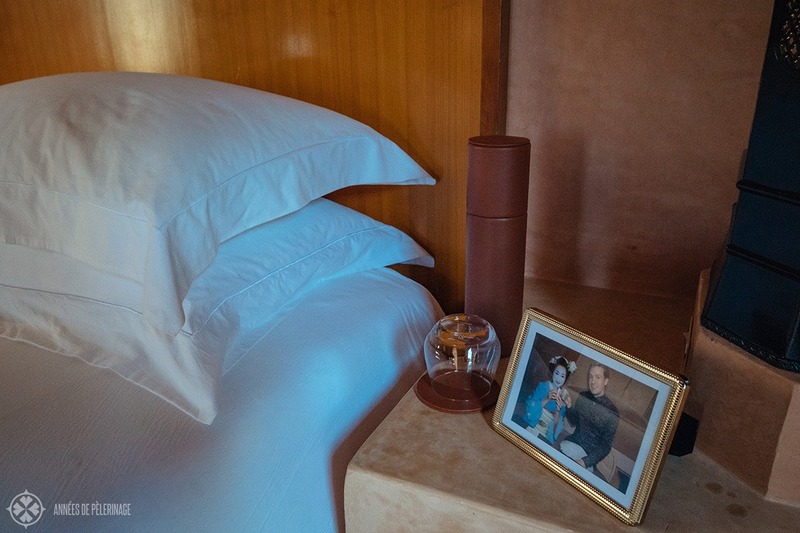 It seemed like the whole management was there to make the stay of every guest truly special. Quite the marvelous dedication. They even put up pictures of me in my room to make me feel more at home. In the toilet, a fresh German newspaper was waiting every day and our rented car was meticulously cleaned for free after each excursion we did (it goes without saying we never asked for this). I really have to say that I rarely have seen such thoughtful dedication. In fact, I’d be hard pressed to name 5 luxury hotels on this planet who could match this kind of service. You’ll find the rooms on either side of this shallow pond – so beautiful, eh? But at the same time I have to mention that on 3 out of 5 nights, the room service was not done after I returned from breakfast. Personally, I feel that there is nothing more inconvenient than a troop of maids keeping you from brushing your teeth or satisfying other bodily needs after you gorged on the breakfast buffet. This should not happen in a true luxury hotel, though the cleaning was always spotless! The same goes for the restaurant staff. They were extremely friendly and dedicated, but a lot of them probably a bit inexperienced. 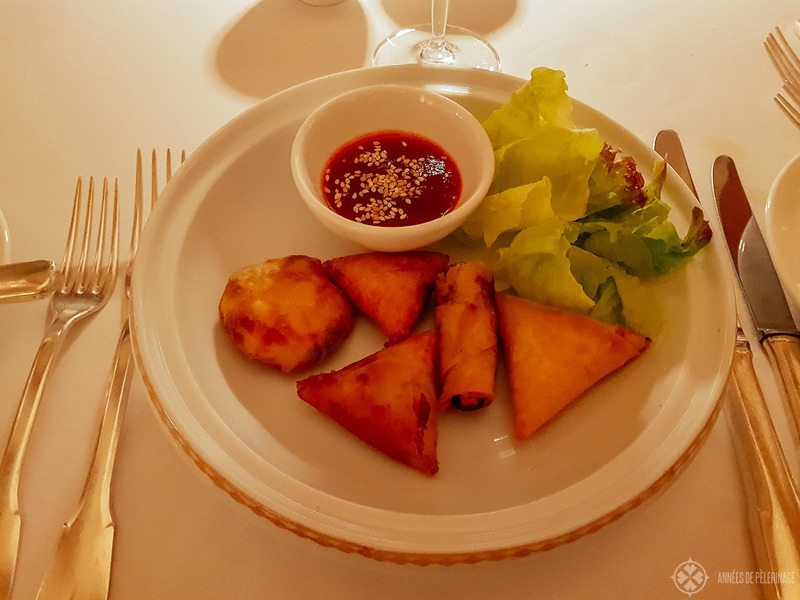 While I don’t expect every waiter to be fluent in English, orders were sometimes misunderstood (like when I ordered some ham and got grilled sausages). A simple question could have clarified this (or asking somebody for assistance). The service at the Japanese restaurant put me off the most. Japanese food is not all about sushi, and if you don’t order sushi, then I don’t expect to be served soy sauce. And if another waiter comes around to refill your unused soy sauce, things gets awkward. Also, they made quite the unnecessary fuss whenever they forgot to refill glasses (which actually shouldn’t happen) and I helped myself. But that’s just mentioning a few of many incidents. But ah well..there are worse things in life. Please don’t misunderstand me: I am sort of looking for a fly in the ointment, but if you are paying 1,000 USD a night for a room and another 100 USD for a dinner, you expect beyond perfect service. I also have to add, though, that each even minor inconvenience was met with a beyond than generous response by the management, so in the end, even spoiled me had nothing to complain about. Amanjena is a spectacular hotel. 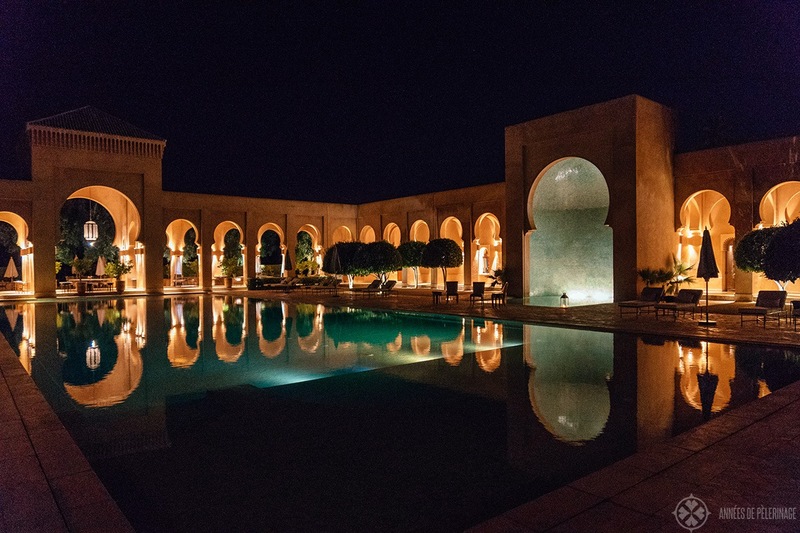 Having compared it directly with Mamounia and Royal Mansour(strolled to the park of the former and had dinner at the latter), I can say, quite without a doubt, that it is the most beautiful property in Marrakech. 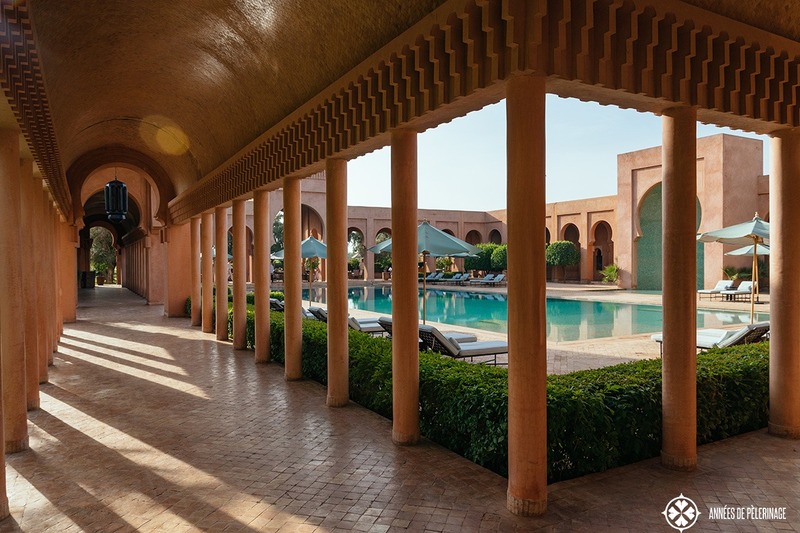 It’s one of these hotels you want to return to over and over again, just to marvel at its ponds and tiled arches. The hotel has its flaws, sure. Service could be better in a few areas, while F&B needs a serious overhaul. At the same time, the management helps to create a very personal and friendly atmosphere so hard to achieve. Amanjena is like a home from home. 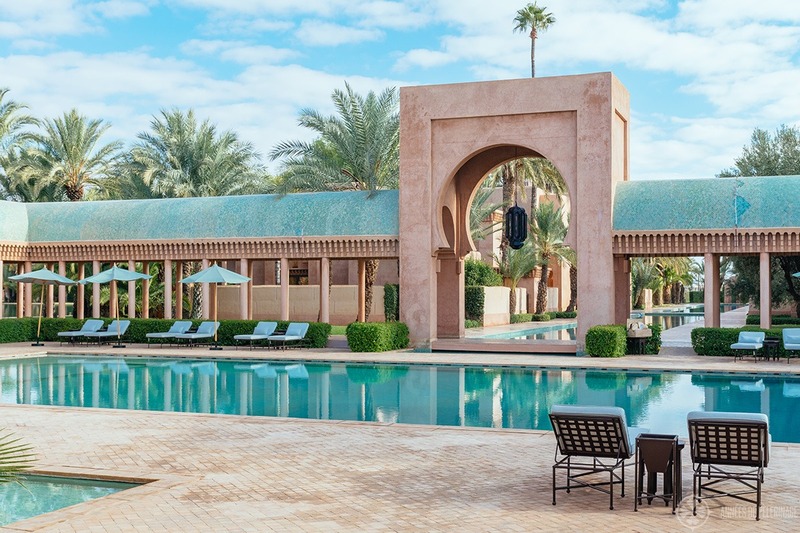 With a golf course nearby, the High Atlas Mountains an easy day trip away, and imperial Marrakech right at your doorstep, the luxury resort offers you everything you need for your perfect holidays. Spa, fitness center, library, shop, pool – what you probably lack is the time to experience it all. But nothing speaks against staying a week at Amanjena. 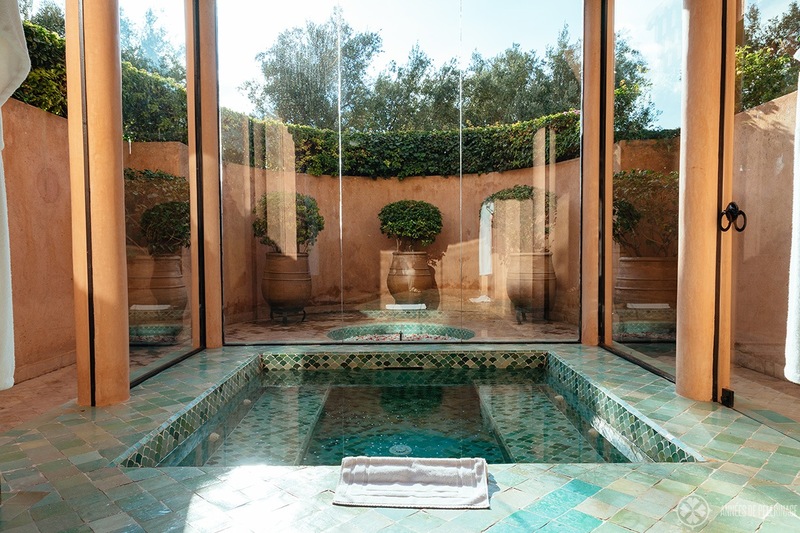 They often have exclusive spa offers on their website to make the stay even more memorable. Sadly, Amanjena was built in the middle of nowhere. 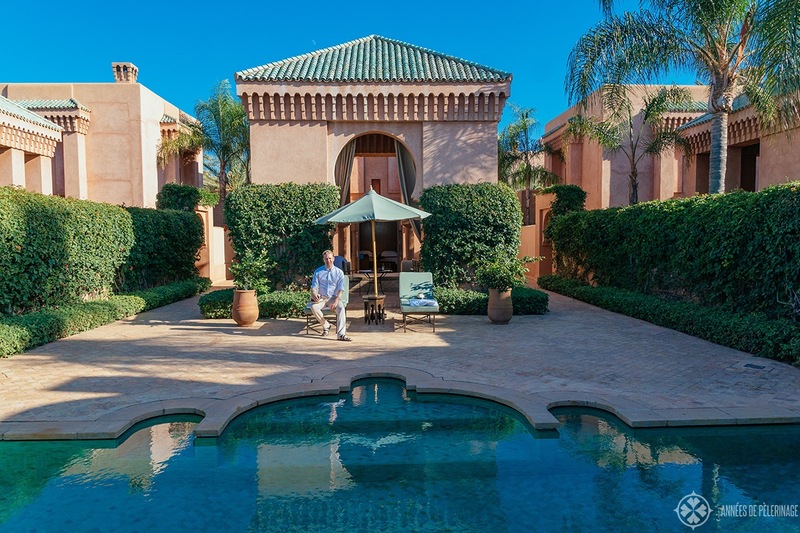 While it is rather easy to access from both the Marrakech medina and the airport, there is nothing of interest in the direct vicinity, nothing to view upon. 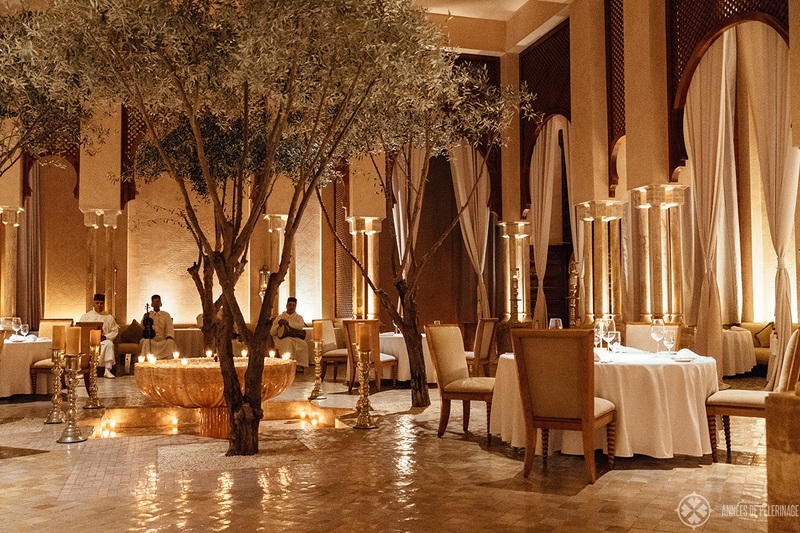 Most newer Aman resorts (just think of Sveti Stefan or Aman at Summer Palace) add a spectacular setting to the spotless service and the high-end luxury. 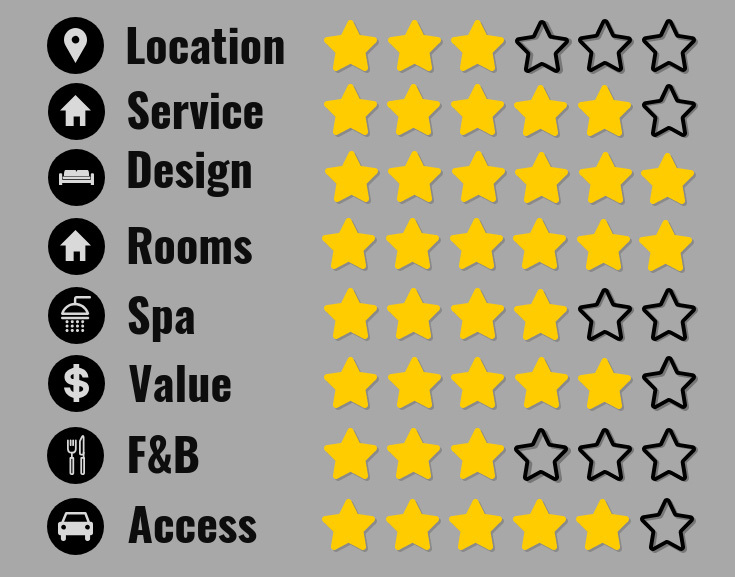 All in all, I can’t give Amanjena the highest rating, which might change when the planned spa-annex is ready and some adjustments have been made in the F&B area. Still, you’d be dumb not to stay a night or two. On a second thought, make it three or four! So, this was my honest Amajena review. 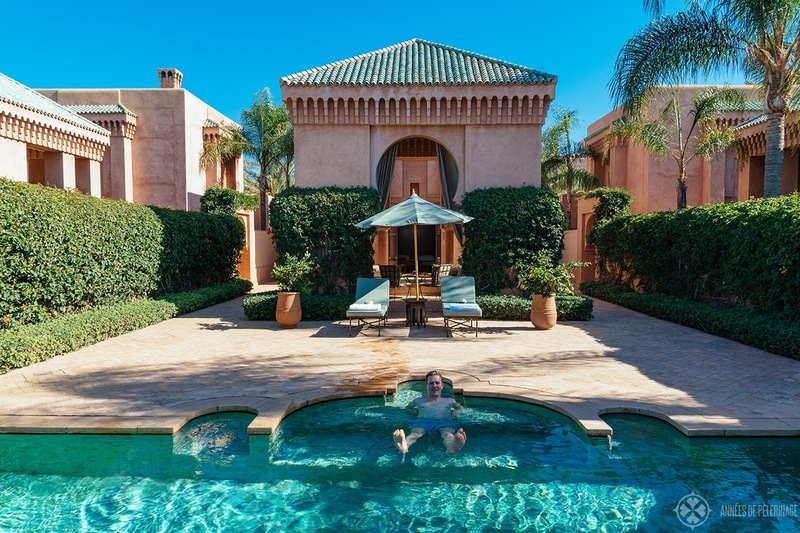 Hope I was able to help you plan your Morocco itinerary a bit. Got any questions? Feel free to ask them in the comments below. Amanjena has been around for a while and the resort has grown in nicely to its surroundings. This hotel is amazingly beautiful. It is visually stunning and spacious. Wow! This hotel looks so amazing. I hope you had a great time. Thank you for sharing your review. Looks very beautiful and well designed. Would have to go for a pool suite here because i think it would feel veryh dry and hot otherwise.